On my most recent visit to Toronto, my good friend, Lesley, gave me a pair of socks. She knit these socks, by hand, for me. They are beautiful. 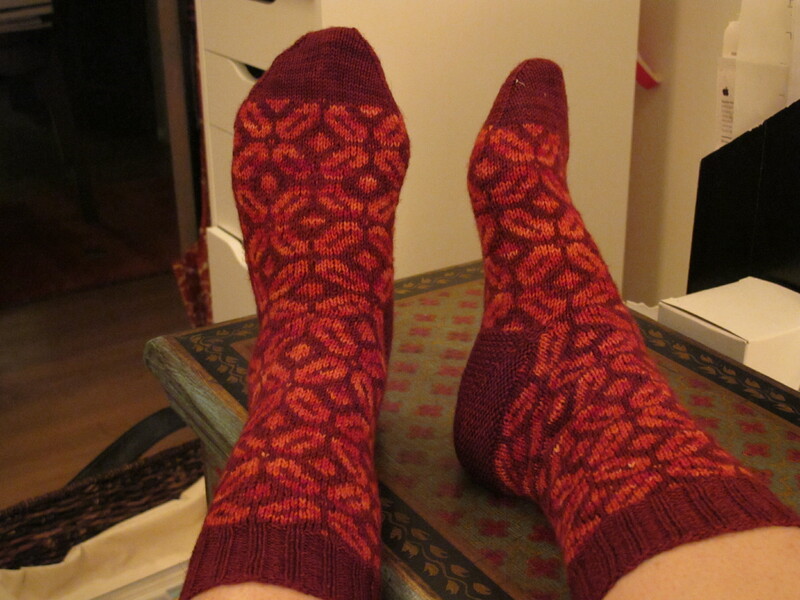 And the nicest thing is that they are the third pair of hand knit socks that Lesley has given me! I do not knit, so I am so incredibly impressed by her talent and also by her generosity. 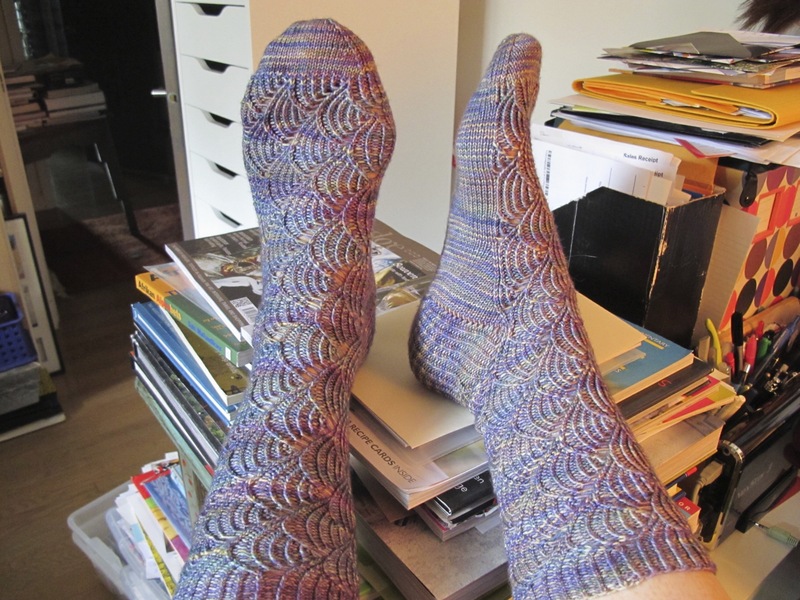 My friend, Marilyn, also knit me a pair of beautiful socks. How is it that I am so lucky to have such wonderful friends? I thought you should see how fantastic these socks are. After taking photos for this post, I think I may have found my calling. I’m thinking I might have a future as a sock model. I think it is important to recognize our talents, whatever they may be! Especially when they are knit with love by your friends! Oh, I LOVE those socks! I’m a bit jealous. Those third ones are just heavenly with that texture. Comfy, warm socks are really important when you have cold feet like I do. I guess now I can actually take up knitting if I really want to because one can never have enough socks. I thought I would run out of things to make! These socks are even better when you can touch them. I would imagine you could knit forever once you got the hang of making socks. The yarns available now are incredible – not incredible enough to make me knit, but enough that I want to buy them! We’d better do lots of things together now. Once I’m a famous super model the fame might go to my head and I’ll be impossible. Super – I’m looking forward to caring your coat as your twirl your feet for photo oppes (opportunities). They are beautiful! You have talented friends. I learned to crochet, but no matter how hard my sister tried to teach me to knit, I never got the hang of it. I’m with you there. When I’ve tried knitting, I can get the yarn so tight on the needles that you can barely get if off, let alone get another needle involved! 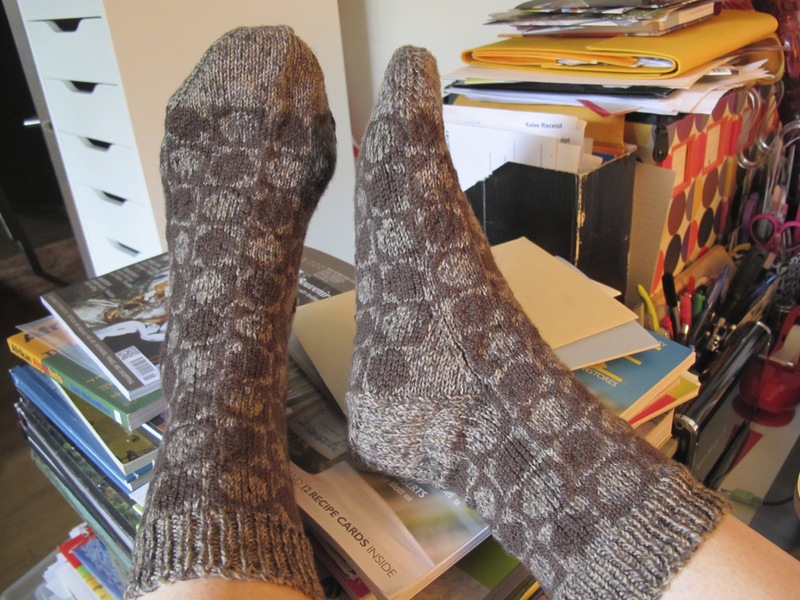 I miss my mother-in-law (Danish) who used to knit me ther most wonderful socks. She lived through the war in Europe and was very frugal. When our socks wore out she would take them back, cut the feet off, and reknit new feet onto the socks. 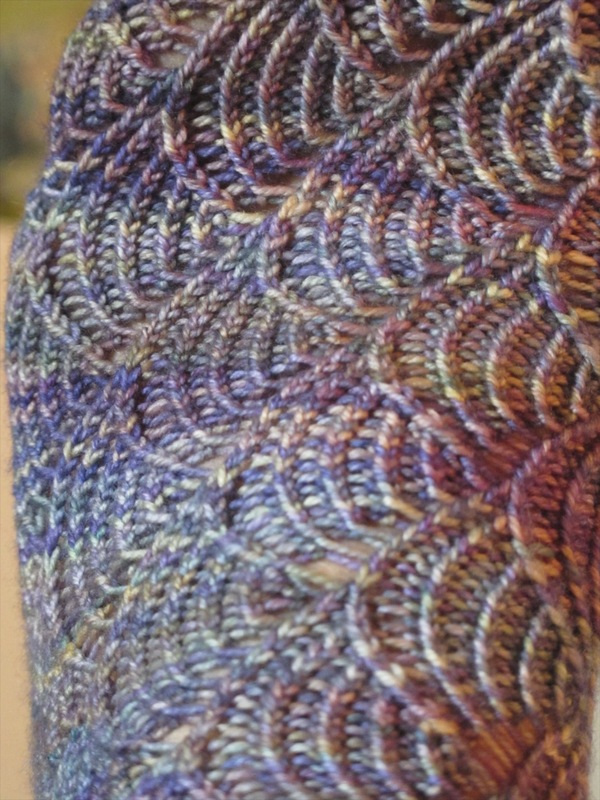 Many of our hand knit socks had slightly varied colored feet and tops. 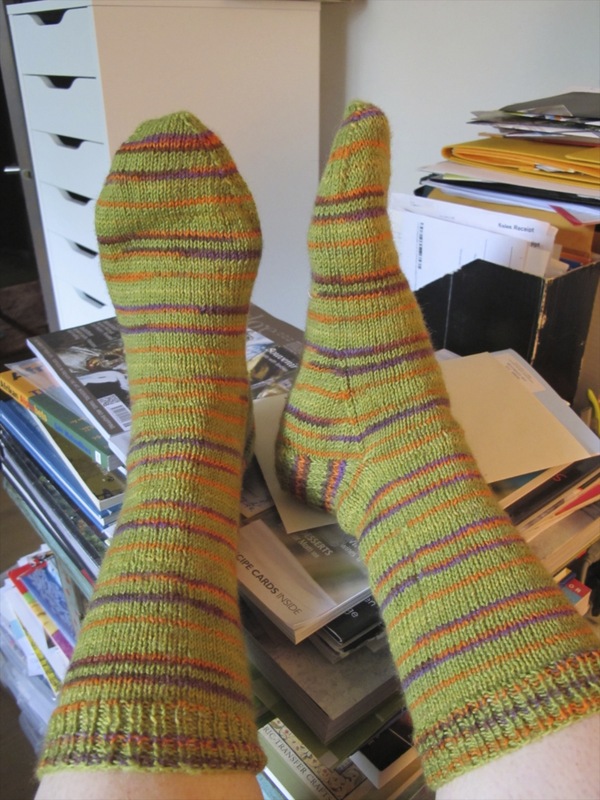 I consider hand knit socks a great labour of love…. I feel the same way exactly! You make me laugh. There are hand models, so why not sock models? I love it. I get a pair of really high-end warm winter socks for Christmas each year and they feel so sumptuous on my feet, I even wear them in the summer (at night it’s cold enough here in the Rockies!). But mine aren’t hand knitted. That is special! You need to look for some friends who knit! You wouldn’t believe how fantastic these are. They are heavier than a lot of commercial socks, but exquisite quality. Thanks for stopping by! Sock models of the world unite! I was almost afraid to wear these “special” socks, until I realized how silly that was. Obviously they were given to me to be worn and enjoyed, which I am now doing. Thanks for sharing.